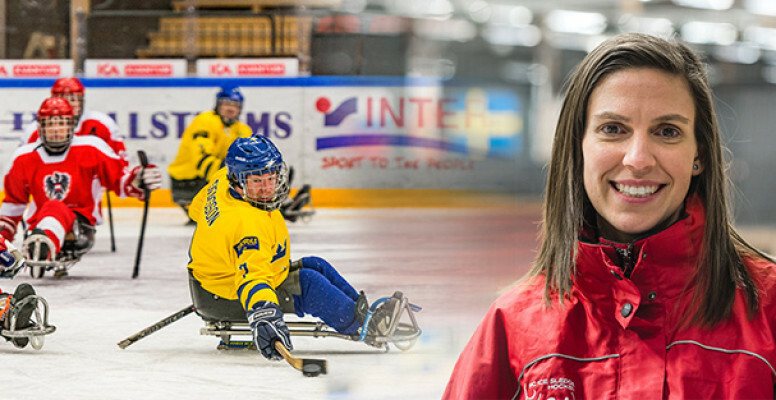 Jessica Korber, sport manager for ice sledge hockey with the International Paralympic Committee, IPC, is extremely pleased with Östersund’s hosting of the World Championships in March. She would like to see more IPC championships in Östersund. “We definitely want to return here in one way or another with ice sledge hockey. It could be with new competitions or perhaps training camps. I can see numerous opportunities,” she says. Jessica Korber says that Östersund Arena is one of the best in Europe, and also praises the entire organisation. Fredrik Andersson, from the J-H disability sports association and Sweden4all which, along with ÖIK, were jointly responsible for the event, is pleased by the praise. But he knew the championships were of a high standard. “For those of us who worked with the event, it was natural for this world championships to open doors to more major events. That was why it was so important to get Peak Innovation’s support for inviting the IPC delegates here. The region is well on the way to assuming a leading position as regards accessibility for sportspeople with disabilities,” says Fredrik Andersson. Fredrik Andersson also says that the arena has become well-known in the Paralympic world, and that there should now be continuing investments in training camps, seminars and championships for Paralympic athletes. He believe this will have a number of positive ripple effects. Östersund’s municipal commissioner, Karin Thomasson (MP), is extremely pleased with the event and confirms that there are ambitions to bid for more championships in the future. What innovation and entrepreneurship can learn from the world of sports.